Will the Super Bowl be played under the roof? The 51st Super Bowl is being played in Houston this Sunday, and even though NRG Stadium has a retractable roof, there's only a small chance they'll need it. It takes about 10 minutes for the roof to open up completely, and the typical rules for an open roof are temperatures between 65 and 78 degrees as well as no chance for rain. Right now, high temperatures are expected to be in the low 70's, well within the 13-degree range, but there's also a chance for light and scattered rain showers. Last week, the NFL told reporters they plan on opening the roof for the big game on Sunday, but we'll have to see if a few light raindrops will have them covering the stadium. Organizers say they'll make a final decision on Saturday, February 4. This will be the third Super Bowl played in Houston and at the last game in 2004, the retractable roof was closed. Nearly a half inch of rain fell that day, and coincidentally enough, the New England Patriots were playing in that game, too. If they decide to cover NRG Stadium this Sunday because of rain, it'll fall in line with about a third of all Super Bowl games. 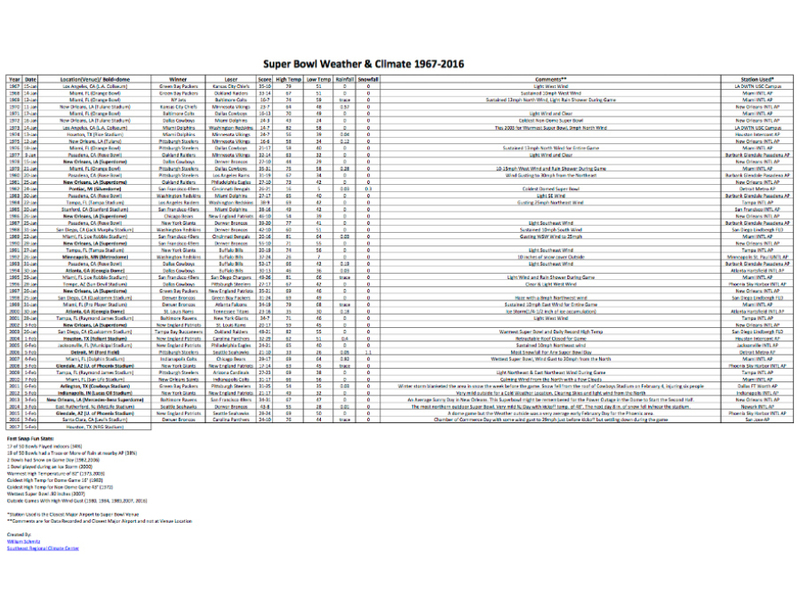 The Southeast Regional Climate Center put together a list of the previous 50 Super Bowl games and the weather accompanying that day. They found 17 out of 50 games (34 percent) were played indoors and 19 out of 50 (38 percent) had at least a trace of rain nearby. We'll have to wait and see if Sunday adds one more game to each of those lists.